From John Preston Neale's Views of the Seats of Noblemen and Gentlemen in England, Wales, Scotland, and Ireland, Vol. 1. Close-up of the head of the cow. 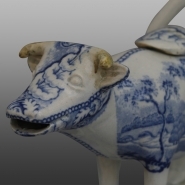 An earthenware cow creamer printed with two views. The pattern printed on the creamer is a variation of two other patterns recorded named Luscombe, Devon by Enoch Wood & Sons and Luscombe, Devonshire, by Ralph Hall. The source of the pattern is the engraved print shown below from John Preston Neale's Views of the Seats of Noblemen and Gentlemen in England, Wales, Scotland, and Ireland, Vol. 1. 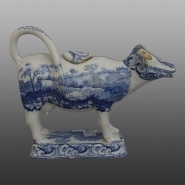 Luscombe is depicted on one side of the creamer, however, on the other side, instead of the grazing sheep that are portrayed in the source print, the engraver used cattle in a rural setting in this version. The maker of this pattern added a small single story extension, in the same style, on the right hand side of the building. The border pattern is known as Smoke Rings and is taken from yet another pattern Blind Man's Buff in the Open.